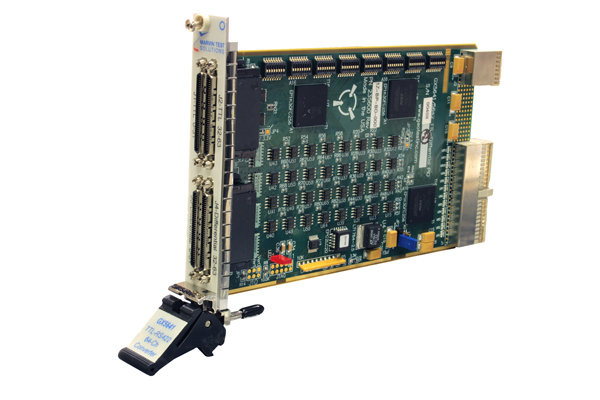 PXI Digital I/O Card, Bi-Directional Differential - GX5641 | Marvin Test Solutions, Inc. The GX5641 is a 3U PXI instrument card that can be used for general data acquisition, process control, Automatic Test Equipment (ATE), functional test, and factory automation applications. The GX5641 consists of 64 bi-directional TTL-differential I/O channels. Each channel has two ports (TTL and differential) which can be individually set to operate in either conversion or static I/O modes. Each channel of the GX5641 can be individually set under software control to operate in one of two modes: conversion or static I/O. In static I/O mode the GX5641 supports 128 individual digital inputs or outputs: 64 TTL and 64 differential ports. The direction of each of these ports can be individually set under software control to be an output or input; e.g., Channel 1 differential port output and Channel 1 TTL port input. In conversion mode the GX5641 supports 64 individual channels, each of which can be programmed to convert TTL to differential or differential to TTL. Each channel’s predefined DIP-switch conversion direction can be loaded at any time, overriding current settings (predefined defaults). In both modes of operation, the TTL and differential signals can be monitored. On power-up, all 64 channel outputs are disabled. The GX5641 includes a 100-Ohm terminator for each differential I/O signal. The GX5641 can also be configured to operate as an independent module, without software control. When configured in independent mode, the module operates in the conversion mode only and the direction of each channel is set at power-up according to the default direction switch settings.